Rules, die-cut counters, a two-sided full-color map, and two dice. The tiny Snits have been persecuted for ages by the huge Bolotomi. Then, one day, inspiration strikes! A few brave Snits run inside a Bolotomus, and attack from within. Can they kick the snot out of their foe's internal organs before the Runnungitms get 'em? 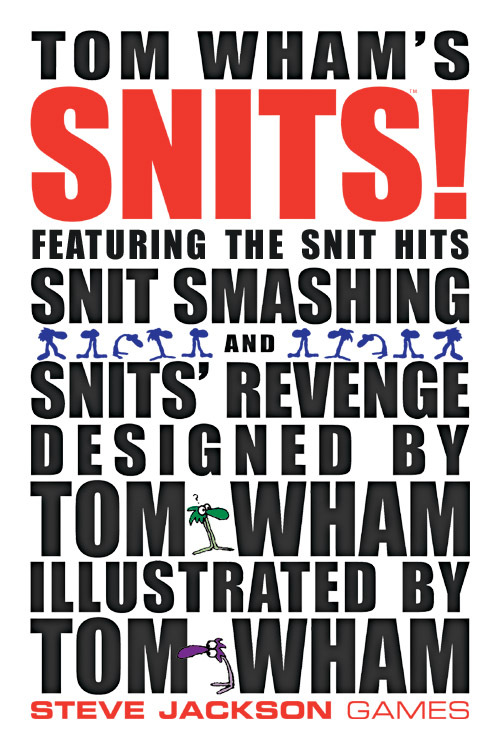 It's the Snits' Revenge! This wacky classic was one of Tom Wham's very first games. Now it's back . . . along with the prequel, Snit Smashing, which previously appeared only in magazine form and has been unfindable for almost two decades. 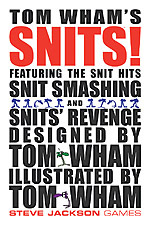 Snit Smashing explains why the Snits are so upset. They just want to run back and forth, to and from the ocean, reproducing. The Bolotomi smash them for fun (hey, it's boring on that beach). No wonder the Snits want revenge . . .
Snit Smashing is for 2 to 4 players and takes about an hour. It's a game of outguessing (or psyching out) your opponents. Snits' Revenge is basically a 2-player game and plays in about a half-hour. It's more of a traditional wargame (if you can imagine a wargame where the board represents the insides of a huge imaginary creature). However, the attacking Snits can be divided between up to four players, who fight it out if they defeat the Bolotomus . . . making it a 5-player game which takes an hour or more. Two insane little Tom Wham games in one box. Under $20. Truly, life is good . . .
Download the Snits! rules in PDF format. Discuss Snits in the Steve Jackson Games Forums.